Air Canada has resumed its seasonal non-stop flights into St. Kitts – Nevis, one of its leisure destinations around the world. The weekly flight, which previously operated on Fridays, now operates on Mondayâ€™s arriving late afternoon and departing an hour later. Flights commenced Robert L. Bradshaw International Airport on December 23rd with flights also operating on December 30th and January 6th. The three flights to date have brought 413 passengers to St. Kitts. When Minister of Tourism, Sen. the Hon. Richard â€œRickyâ€ Skerritt was successful in bringing Air Canada to St. Kitts in 2011, the Canadian-carrier used the subsidiary Air Canada Vacations. 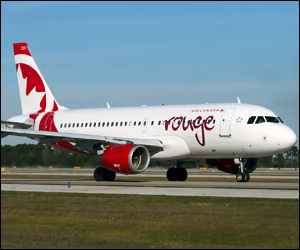 This season, which ends on April 14th, Air Canada is using Air Canada rouge. Air Canada rouge is the stylishly affordable new leisure airline from Air Canada. As a wholly owned Air Canada subsidiary, it’s part of Air Canada’s newly integrated leisure group that also includes Air Canada Vacations. Everyone wants more vacation time away and Air Canada rouge, together with Air Canada Vacations, offers competitively-priced travel to exciting leisure destinations in Europe and the Caribbean: Edinburgh, Venice, Athens and multiple destinations in Cuba, Costa Rica, Jamaica and the Dominican Republic. Air Canada rouge is backed by Air Canadaâ€™s 75-year reputation for safety and reliability and Air Canada Vacationsâ€™ 30-plus year history of vacation travel excellence.